Select either a package below OR Customize your trailer from the available option list below. Press continue to receive a quote on your 6' Wide Single Axle. Click the ‘?’ icon corresponding to each available option for a detailed description. Please select from available trailer lengths or models below. Mounted in the Floor. Heavy Duty Tie Down Recessed D-Ring, mounted in the floor a more secure load. 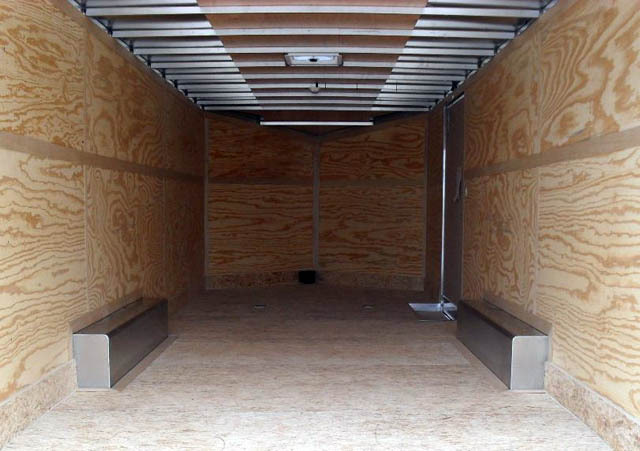 Adds Extra Height to the Interior & Door Openings for More Head Room & Higher Door Openings. Black Rubber Floor for Better Protection from Spills, Easy Clean Up & Better Traction. Rack mounted to interior wall. Holds your Back Pack Blower safe during transport. Holds 2 Gas Cans Mounted on the Exterior of the Trailer. Keeps the Gas Cans from moving or falling over during transport. Mounts to interior walls with many slots for hand tools. Keeps you Hand Tools Organized and prevents them from falling. Lockable & Holds 2 Trimmers. Keeps your trimmers safe and held tight so they do not get damaged on the road. Mounts to Floor & Removable. Holds your Motorcycle Front wheel from moving while Securing and in Transport. Mounted to the Walls or Floor to hold tie downs. Multi use Track with a variety of Straps, Rings & Pockets Available. Recessed in Floors or Walls to Hold Tie Downs. Multi use Track Recessed so it is out of the way with a variety of Straps, Rings & Pockets Available. Mounted in the Floor. Heavy Duty Tie Down Ring Recessed in floor a more secure load. Surfaced Mounted to the Wall. Great for light duty hauling & Taller Pieces. 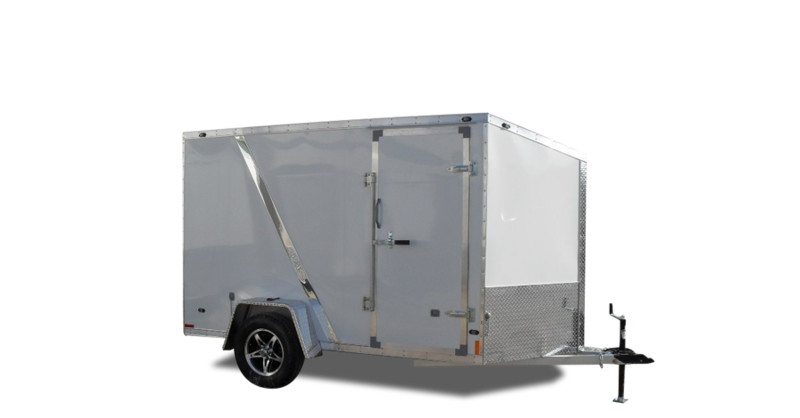 White Vinyl or Aluminum On Walls or Ceiling for a Fresh Clean Look for the Trailer Interior. Any 2 Available Colors with Optional Divider Strip. Show your Team Colors or Just Dress Up Your Trailer. Upgrade from the Standard Zinc Cam Lock, Hinges & Hasps. No Rust Ever, Aluminum Bar Locks, Door Hold Backs & Hinges with Stainless Steel Hasps. 24" Door with Cam Lock. Makes Access to the Front of the Trailer Easier. Single Axles Only. Added Security when Towing & Stopping. Aluminum Racks for all Sizes of Trailers. Carry your Ladders or Longer Accessories on Top of Your Trailer to Free up the Valuable Interior Space. Alternative to Electric Brakes. The Braking Sysem is Completely on the Trailer. This Allows for Multiple Vehicles to use the Trailer without Extra Equipment. Exchange Incandescent Ligts for LED Lights. LED Lights draw less power from the Vehicle and Last much Longer. You Will Not Pay for another Light for this Trailer. Installed in Place of the Standard Curb Side Door. Allows Easy Access for both Inside & Out with an Interior Full Screen and Fixed Window. Installed in Place of the Standard Curb Side Door. Allows Easy Access for both Inside & Out. Mounts in Door for added security. Can be used with or without Cam Lock. Can be Installed at the Rear, Side or Front of Your Trailer. Ramp Doors can make your trailer more Versatile to allow you to Drive In and Out a Car, ATV, Snowmobile or Piece of Equipment. To Mount Your Spare Tire to the Front of the Trailer. Optional Mount for those who want to keep their Spare Tire on the Exterior of the Trailer. To Mount Your Spare Tire on the Interior of the Trailer. Optional Mount for those who want to keep their Spare Tire on the Interior of the Trailer Safe from Theft and the Weather. Recessed Compartment under the Floor. Keeps Spare Tire out of the way until Required. Come in Pairs for Air Flow Through the Trailer. Opens to the Front for Full Air Flow, To the Rear for Standard Air Flow and Can be Closed when not needed. Installed over Roof Vents. Allows the Roof Vent to be left Open during Travel and when the Weather is Bad. Mounts in the Roof & Opens With Scree. Allows Heat and Odors to Rise out of the Trailer. Come in Pairs for Air Flow Through the Trailer. These Vents Are Fixed Open to allow Constant Air Flow and Face Rearward at all times. Our 2.5 Gallon Gas Can Rack is perfect for your enclosed trailer. It can hold either a 2.5 gallon gas can or a small cooler. It is a great way to organize your supplies and keep chemicals or your lunch from spilling or being knocked around. Our 5 Gallon Gas Can Rack is perfect for your enclosed trailer. It can hold either a 5 gallon gas can or a cooler. It's a great way to organize your supplies and keep chemicals or your lunch from spilling or being trampled. Not only does it hold spray cans, it now has a second level to hold quarts of oil. It is also expandable with an additional quart bin (RA-10B) or a gallon bin (RA-10C) You can expand this rack with the additional racks right down to the floor if you needed to. This expandable bin holds the standard oil Quart (rectangular plastic), tools and more. This expandable bin is the 1 gallon (square and round plastic) size, tools and more. It's perfect for push brooms, hoses, cords and more. It is adjustable and has no obstructions from the bottom of the shelf to the floor. It's not only a bunk, it's also great for storage too. Lumber and equipment not included. This rack can hold up to 6 shovels. This item will securely transport a spare tire and is expandable with the purchase of additional holder. RA-16 comes with ONLY 1 holder. Shown here with additional holder. This adjustable shelf kit goes on one side of the trailer. It uses standard 12" Shelving lumber, which is not included. This will prevent your ladders from sliding forward or backward while on the Fitz-All ladder rack. Very easy to install with just one bolt. Fits most other ladder racks. Can also hold a "Chainsaw" or almost anything with a loop style handle. Can also hold a hand-held blower on the tube hook. Trimmer rack will securely transport 3 trimmers. Holds rakes, hoses, cords and more; it can hold almost anything. Can hold either a 3lb. or 5lb. spool. This adjustable Road Cone Holder is to be used with the RA-16, Spare Tire Holder. The Adjustment allows you to hold cones from 12" to 36". Some State rquirer you by law to use Road cones at the end of your trailer when you are working at a job site. You will be able to transport 2 spare tires with this additional hook and it is only used with an RA-16 Spare Tire Holder.